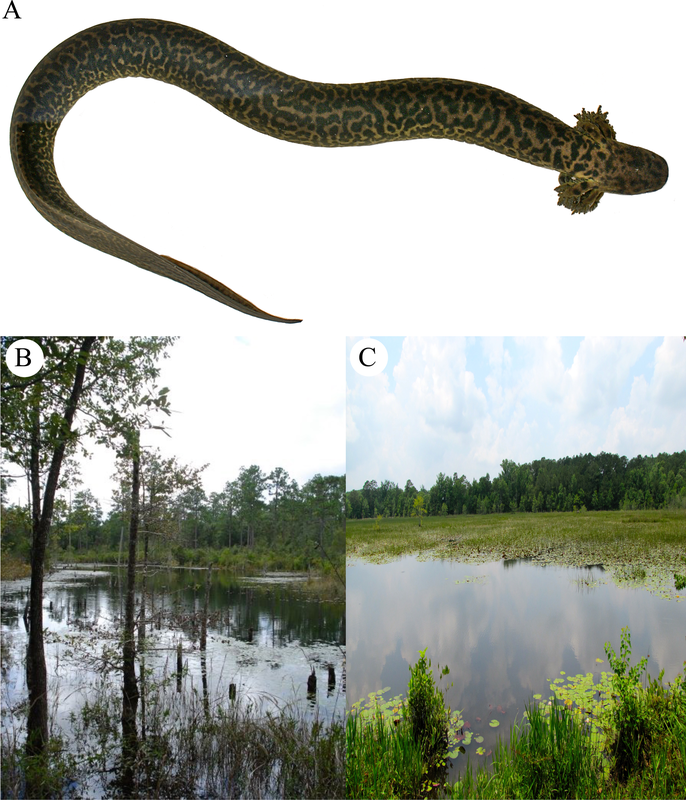 Sean Graham, Richard Kline, David Steen, and Crystal Kelehear have just published a description of a new species of salamander from the Gulf Coast of Alabama and Florida (reference at bottom). It’s quite a handsome beast, with bold reticulations and an almost decorative frill of external gills. (From paper): A) Siren reticulata paratype specimen captured in Okaloosa County, Florida. (B) Location of Siren reticulata captured in 2009 by D. Steen and M. Baragona. (C) The type locality of Siren reticulata, Walton County, Florida. Photo by Pierson Hill, from the New York Times; another photo by Hill is in the paper. If it’s the same animal photographed by Hill for the paper, this is not one of the paratypes. It’s a species of siren, a type of permanently aquatic salamander that lacks hind legs and has three pairs of external gills. There are, with this new one, three species known in the genus Siren, all from the southeastern United States. The new species stands out for three reasons. First, it’s a genuinely new discovery, not just elevating to species status a previously known subspecies or population of some other species. The new species, Siren reticulata, is at least broadly sympatric with both the Lesser Siren (Siren intermedia) and the Greater Siren (Siren lacertina), and the authors’ genetic analysis show it to be markedly distinct from both of these species. It thus seems to be a “good” biological species. Much of the “increase” in biodiversity these days, especially in biologically well-known regions such as North America, comes from changes in taxonomic rank, not actually finding a previously unknown form. Second, it’s awfully large for a previously unknown species: around 60 cm total length, and that’s based on a sample of just 7 individuals used in the description. Again, this stands out because the beast is from North America, where there are lots of new species of small animals to be described, but not so many largish ones. It’s bigger than the Lesser Siren, but not as big as the Greater Siren (which gets up to a record size of about 1 m in total length). Of course, it’s likely that the new siren grows larger than can be judged from just 7 specimens. A siren tentatively assigned to S. lacertina collected in the Fish River in Baldwin County does not conform [to the description above]. This specimen, which has 39 costal grooves and is 520 mm long, has a silvery gray ground color. The back, sides, and tail are profusely marked with conspicuous dark gray spots and vermiculations. The venter is unmarked. Additional specimens from that locality, as well as some localities to the east, will be needed to determine whether the specimen on hand is correctly assigned to species. A few other specimens over the years apparently sparked some interest, but it was not till Steen caught one in 2009 in Florida that serious work began, and now Graham, Steen, and colleagues have been able to confirm that there is a new species, and Mount’s suspicious specimen belongs to it—so good on ya, mates, to Graham and colleagues for solving a decades-old mystery! The case fits a classic cryptozoological scenario: a new animal is reported on insufficient evidence, stories and reports continue to come in, and then, finally, proof is brought to light—in this case, 7 salamanders, along with their attendant morphological and genetic data. I’m not sure if cryptozoologists will embrace this discovery, as they prefer their ‘cryptids’ (unknown animals) to be big, but it is big for a salamander, and a big one for the U.S.
As a common name, the authors propose “Reticulated Siren”, dismissing the name “Leopard Eel”, by which it was apparently known informally (perhaps when it was still just a cryptid). (Large aquatic salamanders with reduced legs are often called “eels” in the southern U.S.) If “Leopard Eel” is a genuine vernacular name, then I would suggest that that name be used. Common names should be just that: part of the language used by people who actually know the species. Standard English names (which many birders and some herpers have a passion for) are fine, but they should not be mistaken for common or vernacular names. Perhaps “Leopard Siren” would be an appropriate middle ground to serve as both type of name. Graham S.P., R. Kline, D. A. Steen, and C. Kelehear. 2018. Description of an extant salamander from the Gulf Coastal Plain of North America: the Reticulated Siren, Siren reticulata. PLOS ONE 13(12): e0207460. Mount, R.H. 1975. The Reptiles and Amphibians of Alabama. Auburn University Agricultural Experiment Station, Auburn, Alabama. This entry was written by whyevolutionistrue and posted on December 18, 2018 at 11:20 am and filed under amphibians, systematics with tags David Steen, new species, Robert Mount, Sean Graham, siren. Bookmark the permalink. Follow any comments here with the RSS feed for this post. Both comments and trackbacks are currently closed. Cool. I wonder what all that frill is used for. Swimming? So these gills make it a kind of larval salamander, like the Axolotl? Could one call that neoteny? It would be interesting to see if with hormones one could induce an ‘adult’ stage, as with the Axolotl. I think ‘leopard siren’ is a good compromise for the common name..
Do the external gills make it a neonate? Neotenic– they retain the gills throughout life. A little bit Renaissance beast, perhaps? Handsome, with frills. Very cool. Saw this discovery in the New York Times last week. Hope to see some actual specimens when I visit the area soon. Sirens are rarely seen without specific effort, though. If I see one, I’ll send pics. I’d tend to agree about using the vernacular name. So, adopting “reticulated siren” as the formal English name for what’s commonly known as a “leopard eel” seems consistent. Fascinating account. It’s interesting that such a large animal escaped detection. I’ve often thought biologists should inquire with neighborhood children who tend to know all the indigenous critters. Growing up, my friends and I spent a lot of our time catching things. That’s a lot of unpaid field work. I agree with the statement about common names. The goal should be to list the names by which these things are known, NOT to establish new names for them. That way researchers in the field can figure out “This person’s talking about a blue bandersnitch; that’s the Anhydrosia anomilia I’m after!” If it’s the name of a cryptid…well, it’s the name of a cryptid. Turns out the cryptid isn’t so cryptic anymore. Very cool find! I have to keep my eyes out for them! Hi Doc ,don’t know if this is fake or real . This post was written by Greg Mayer. It was Greg who answered you. He writes GCM to differentiate himself from JAC. Oh i see ,thanks for that .Going back to the new critter being named after TSS,that is outrageous . How could they do that to the poor creature? I read about this a few days ago on novataxa.blogspot.com and tetzoo.com. How wonderful that new species are still being discovered (rather than reclassified, which is fine, but it’s not quite as cool) here in over-populated, over-developed north America. I do understand why the authors resisted using the common name Leopard Eel, as it’s neither a leopard or an eel, and I’ve been noticing a trend among biologists who are against naming animals after other animals. The guys at Herpetological Highlights gripe about this quite a lot. That doesn’t mean it won’t be called a leopard eel by some and the reticulated siren by others. I think its no different than regional preferences between wood lice, pill bug, roly poly, monkey peas,cheesey-bug, chisel bob, and so on. Now if only they’d stop using stupid pop culture references for binomials…no species should be named for Beyonce or tRump! Greg, thanks for clarifying what is “new” about this salamander. Based on the newspaper reports, I could not get a clear picture. This salamander is gorgeous! Especially the gills. I hope that is prospers. What an amazing find. Is there any indication why it took so long to classify this beautiful siren? Are they extremely rare / endangered? Perhaps their habitat is hard to reach…also the fact they they never leave the water. When I was living in Lombardy, there used to be seasonal “epidemics” of salamanders, black with yellow slashes (I believe they are called flame salamanders). They would try to cross the local roads with occasional unhappy results. One came through my front door and, when it saw me, scuttled under the wooden floorboards. They are quite big compared to frogs or newts, maybe a foot (30cm) or more, including the tail. The video below shows the eggs, larval, juvenile and adult forms. The stream is very like the one near my old house, at the source of the River Molgora which passes into the River Muzza in the province of Milan. Oops. I gave the wrong link here. I read the notes in Italian: apparently the eggs are not from the salamander, but from a frog. I saw it maybe 50 years ago: at least it taught me what a salamander was. They are not indigenous to the UK, so they don’t get mentioned much here. We have newts, frogs and toads. The amazing thing about salamanders is that, as pointed out by St. Augustine in his “The City of God,” they can exist in the midst of fire indefinitely without apparent discomfort. He cited this as proof that it’s possible for human beings to be tortured by fire in hell forever without being consumed by the flames. This is a major point of agreement between Christians and Moslems. The salamander I quoted above has yellow streaks (often more yellow than black) and is called the fire salamander (not ‘flame’ as I wrote). Maybe that accounts for the connection with fire. It’s in Italy, so that could account also for the Christian connection. Augustine also spent some years in Milan at the time of his conversion so may have actually known this species by sight. Many salamanders have primitive lungs or none at all (skin breathers) and they have high water content and are smooth, wet skinned. Maybe, when they are dropped in a fire, because they don’t breath in the fumes, they survive longer than other animals, at least long enough to scamper out of the fire. I have no evidence of this and have no intention of even testing the theory. Salamanders cannot survive in fire. But they do crawl inside cracks in logs, and if the log is used in a fireplace, the salamander will try to escape. So, if the salamander is lucky enough to have a path out of the log and through the fireplace, the amazed firemaker will see a salamander emerging from the fire. Amazing: a 60 cm animal from the US that had yet to be discovered (so to speak). What other delights await us?